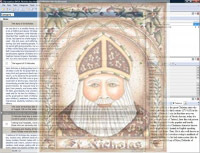 This St Nicholas day checklist is a historical and celebration guide explaining origins and rich traditions of this great ancient feast coming from Christian orthodox legacy. This checklist provides you with overview at origin, his deeds and merits which make him recognized worldwide as one of the greatest saints, and of course the holiday dedicated to honoring this wonderful historic person. Traditional recipes include hot flavored tea, mulled wine, different kinds of punch, spiced and honey cookies, themed cakes with honey and nuts, hot desserts with cream, colorful marzipan, all kinds of candies, meat soups, pastry with almonds, etc (actually every nation has dozens of their native holiday breads which you can study to cook). An example of the Faith and a life of humility, as a teacher of abstinence you did inspire and lead your flock and through your truthfulness of your deeds were exalted by greatness through your humility uplifting all and by poverty gaining wealth. Father and hierarch Nicholas intercede with Christ our God that our souls be saved.